German Keno takes place every day at 9.40pm CET, costs as little as €1 for a game and boasts a top prize of €1,000,000. This exciting game features fixed prize amounts so you know exactly how much you can win and is also very flexible allowing you to determine how much you want to play for! How does German Keno work? German Keno works just like any other lottery — you pick the numbers you think will be drawn and win a prize if you guess them correctly. The amount of money that you win is determined by the amount of numbers that you correctly guess. In each draw, 20 numbers are drawn from a total of 70. In any single bet, players can choose anywhere between 2 numbers and 10 numbers. The more numbers the player chooses and matches the higher the possible winnings. You can also increase your winnings by increasing the stake amount. How does betting on German Keno at Lottoland work? Instead of entering the official German Keno Lotto draw, you place a bet on the outcome of it. You pick the numbers you think will be drawn in the same way as if you had entered the official lottery draw. How do I play a game? Select from 2 to a maximum of 10 numbers you wish to bet on from a pool of 1–70 for each line bet. You can use the QuickPick feature to automatically choose 10 numbers you want to bet on. Another choice is to use the Quick Selection feature within the betslip which will select a given amount of numbers for you from 2 to 10. How do I select my stake? The higher your stake amount the higher your winnings. In the bottom right hand corner of the playslip you will find the Stake section. Simply choose whether you want to play a single stake or double, 5x or 10x that amount. If you choose double you will double your potential winnings. Choose 5x for the chance to win 5x as much and 10x to increase your potential winnings by 10. How do I choose less than 10 numbers? Select each number in the slip individually or by using the Quick Selection function at the bottom of the betslip. How does the prize structure change in relation to the amount of numbers selected for a game? The more numbers you choose, the higher the amount you can win. However, if you chose less than 10 numbers for a single line bet, you can win more for each tier of that amount of numbers. The following example illustrates how this works using the example of choosing 10 numbers versus choosing 5 numbers. If you choose 10 numbers in a single line bet, you can win a maximum of €1m but you will only win @20 if you correctly guess 5 numbers. However, if you only choose 5 numbers in total in a single line bet, then you can win €1,000 if you correctly guess all 5, but this is the maximum that you can win for this bet. So there is a trade-off between how many numbers you choose and the maximum amount of money you win for each prize tier. How much does a game cost? The cheapest possible line bet is €1 for a single stake and the most expensive is €10 for a multiple stake of x10. The amount of numbers you choose and the stake value determines the price for a line bet. What is the Plus5 game? If you choose to play the bonus Plus5 game for an extra €0.75 you will be entered into another draw. You will be automatically given 5 numbers to take part in the bonus game and if you match all 5 you will win the jackpot. You can change your 5 numbers by clicking the magic wand icon. The main Plus5 jackpot is worth roughly €7,000. In order to win the maximum prize of €1,000,000 you have to play 10 numbers at the maximum stake of x10. What are the odds of winning the top prize? The odds of winning the top prize are 1 in 2,147,181. Can you explain the different prize tiers available? How can I win a prize for not getting any numbers correct? If you choose a maximum of 10, 9 or 8 numbers in any single line bet, you win a prize if you correctly guess 5, 6, 7, 8, 9, 10 or 0 numbers. You do not win any prizes for guessing 1, 2, 3 or 4 numbers. When does the draw take place? The draw takes place every day at 9.40pm CET time every day. If your account has been verified, proceed to your account and withdraw your winnings. If your account has not been verified, you will first need to provide proof of your ID and proof of address. Once this has been confirmed you will be able to withdraw your winnings. Is the payout guaranteed? How do I know? 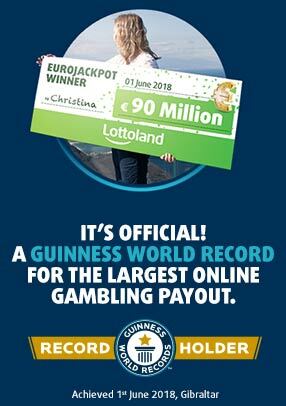 All your winnings are guaranteed to be paid out at Lottoland! All bets are placed on your behalf with EU Lotto Limited, licensed by the Government of Gibraltar and regulated by the Gibraltar Gambling Commissioner and the Revenue Commissioners in Ireland. Why should I bet on German Keno at Lottoland? Keno is also a very flexible draw, allowing you to stake anything from £1 up to £10 on a single game. Furthermore, the prize tier amounts are fixed, so you know exactly how much you can win. There’s also new draws every day, so a new chance to win is always just around the corner.